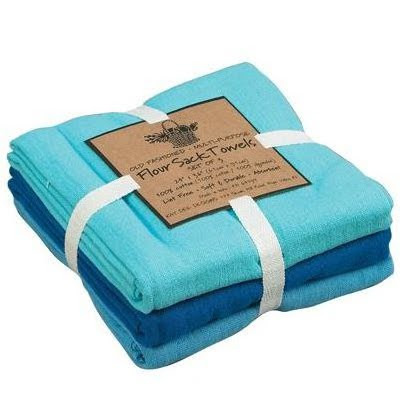 These Kay Dee Designs Coastal Flour Sack Towels (Set of 3) are lint free, fast-drying, and ideal for glassware. Made of 100% cotton. Each oversized towel measures approximately 24″ x 36″. $12.94. Buy here. 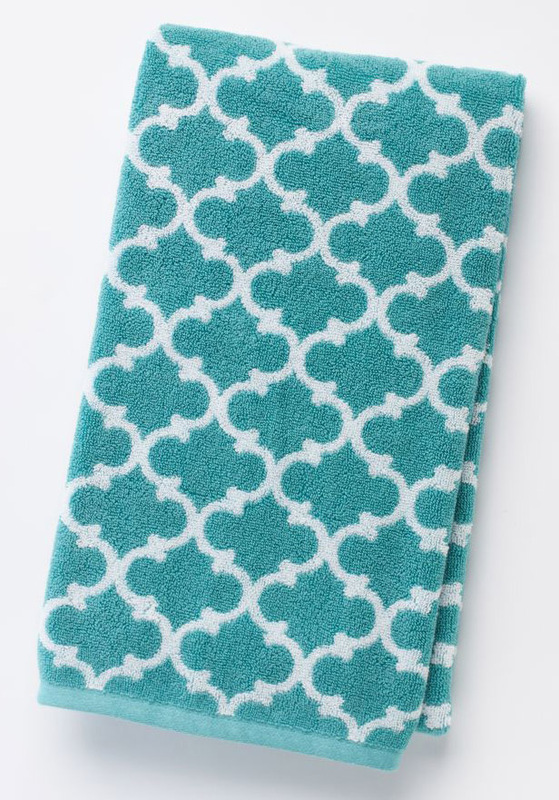 Ultrasoft fabric and a trendy trellis print take center stage in these Lattice Bath Towels in Bright Aqua. The fade-resistant, highly absorbent towels feature Spot Stop technology that defends against discoloration. $11.99-$29.99 Sale $5.99-$14.99. Buy here. 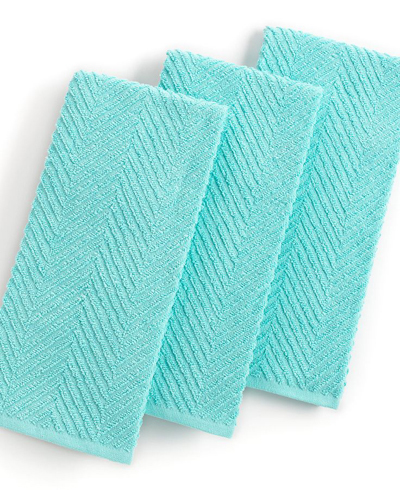 Grab style and keep function with a set of three Textured Terry Aqua Kitchen Towels from Martha Stewart Collection that step forward in an eye-catching color to wipe up spills, aid in prep and add an accent to your space. The textured design sets a sharp appearance for any room, while the highly absorbent terry quickly cleans up. $16.99. Buy here. Brighten up your bathroom with this soft, thirsty 6-pc. Quick-Dri Towel Set that is textured to reduce drying time. Includes 2 bath towels, two hand towels and two washcloths. $84 Sale $34.99. Buy here. 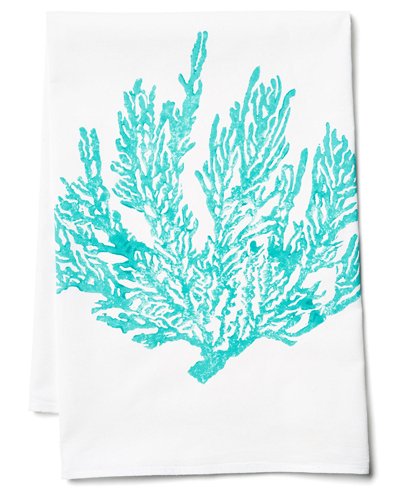 This set of cotton Sea Fan Tea Towels boasts a block-printed sea fan motif for a touch of the beach even in the city. Set of 2. $30 Sale $22. Buy here. 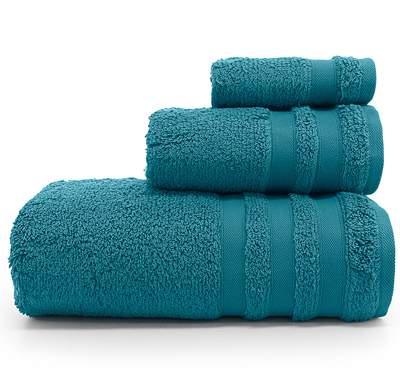 From Studio D, the Turquoise Cloud Bath Towels add a colorful update to your bathroom. Made of cotton. $5-$15. Buy here. Kate Spade’s playful yet stylish Larabee Dot pattern can now be found in the bathroom. 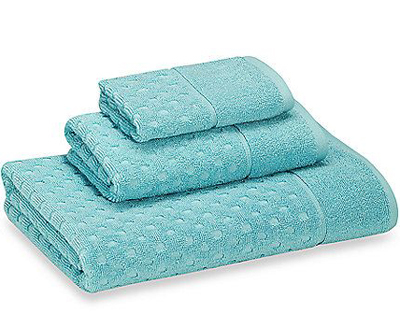 The soft and absorbent Larabee Dot Bath Towels feature a jacquard dot design with two-ply construction. $16.99. Buy here. 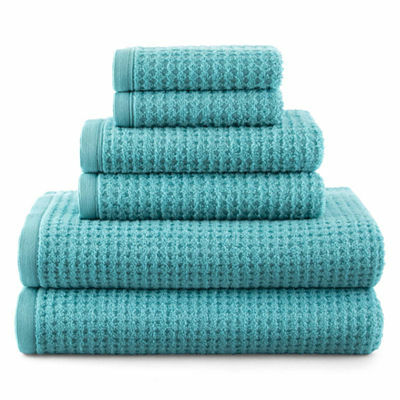 These beautiful Lacy Cutwork Bath Towels will add a burst of color to your bathroom. The super-soft towels are made of cotton. $8-$36. Buy here. This Organic Cotton 6-pc. Bath Towel Set is the perfect pick. The organic cotton construction of each towel ensures a lovely look and feel, keeping you cozy for years to come. Eco-friendly design suits your natural fashion sense. Dobby border adds a trendy touch. Reinforced trim prevents fraying. Soft cotton construction offers lasting comfort. 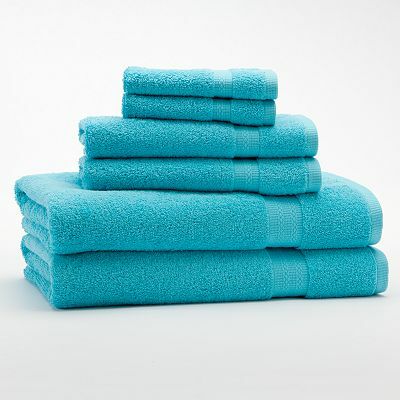 6-piece set includes: 2 bath towels, 2 hand towels & 2 washcloths. $94.99. Buy here.